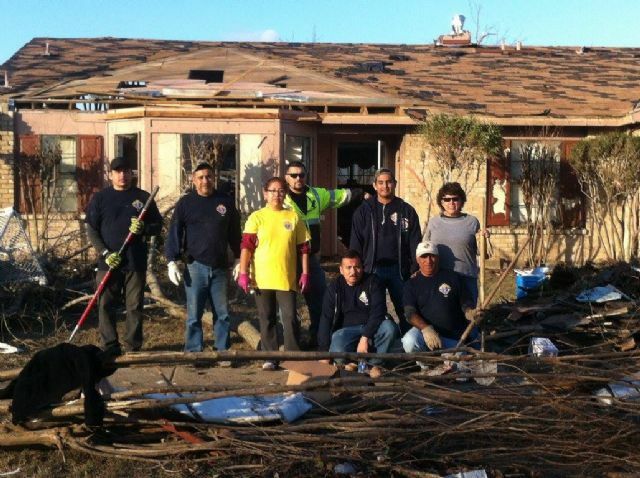 Council 6402 and their families brought a crew together to help clean up a devastated Garland neighborhood on January 1, 2016 following the tornado damage that occurred on Dec 26. There are several photos posted on the KofC Dallas Facebook page. Thanks to Nick Flores for sharing and for your kind work in support of the community. These pictures do not do justice to the devastation of last week’s tornadoes in the Dallas area. Our Knights of Columbus Council 6402 and families plus our Worthy District Deputy Gary Labac joined the many other volunteers in helping with the debris clean up in the area. Please keep the families, officials, and volunteers working on the recovery efforts in your prayers.